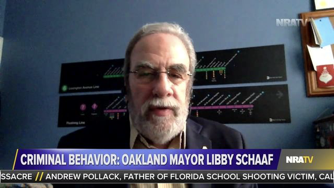 Link to video of my interview: " Michael Cutler: Criminal Behavior: Oakland Mayor Libby Schaaf"
I was a guest on the Grant Stinchfield show on NRATV on March 5, 2018 to discuss the outrageous conduct of the mayor of Oakland, California, Libby Schaaf, who alerted the residents of her city that ICE was preparing for a field operation, possibly within hours. A link to the video of my segment has been posted. The enforcement of our immigration laws is critical to public safety and national security. Our immigration laws are utterly and totally blind as to race, religion and ethnicity. Furthermore, the most likely victims of transnational criminals are the members of the ethnic immigrant communities in which these foreign criminals reside and ply their “trades.” As I noted during my interview, ethnic immigrant communities include people from around the world, not just Latin America. It is also important to note that our immigration laws are also supposed to protect the livelihoods of Americans as well as their lives. The vilification of immigration law enforcement personnel has caused a massive increase in the number of violent assaults against ICE and other immigration law enforcement officers. Mayor Schaaf endangered the safety of the agents who go in harm’s way to enforce some of America’s most fundamental laws, removing the element of surprise that law enforcement officers depend on in making arrests particularly when they make arrests at the residents of those targeted for arrest. Under the current laws, each alien who is shielded, harbored, aided, abetted or induced to enter the United States or remain illegally is viewed as a separate crime. The challenge here is to determined how many thousands of illegal aliens were, in fact, potentially shielded and harbored, aided and abetted by Mayor Schaaf’s actions. It must also be noted that if charges are brought and an individual is found guilty of these crimes, sentencing is determined by stringent minimum mandatory sentencing guidelines. As it stands, hundreds of aliens who were sought during the field operation could not be found and likely evaded ICE because they had been warned. On November 22, 2016 FrontPage Magazine published my article, ‘SANCTUARY CITIES’ VS. NATIONAL SECURITY AND PUBLIC SAFETY: Why ‘sanctuary city’ mayors should be given an MVP Award by ISIS and drug cartels. Author MichaelPosted on March 5, 2018 March 5, 2018 Leave a comment on Link to video of my interview: " Michael Cutler: Criminal Behavior: Oakland Mayor Libby Schaaf"